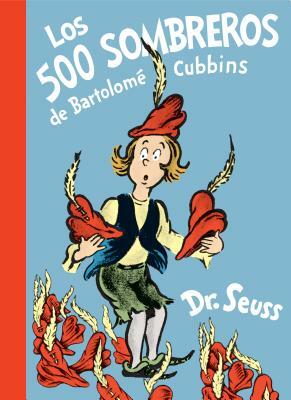 Los 500 sombreros de Bartolomé Cubbins (The 500 Hats of Bartholomew Cubbins Spanish Edition) (Classic Seuss) (Hardcover) | River Dog Book Co.
Edición en español de uno de los primeros clásicos de Dr. Seuss, ¡un libro ideal para hablar acerca del acoso! Ahora con ilustraciones a todo color, la historia de este joven campesino y su trato injusto a manos del Rey Derwin es una de las primeras y menos conocidas obras de Dr. Seuss. Es, sin lugar a duda, singularmente «seussiano», y trata un tema que preocupó a este buen doctor a lo largo de toda su vida: el abuso de poder (como en Yoruga la Tortuga y ¡Horton escucha a Quién!) y el humor puro (como en El Gato Ensombrerado y muchos otros libros que escribió e ilustró). Tan actual hoy como cuando se publicó por primera vez en 1938, ¡este libro es ideal para los admiradores de Dr. Seuss y para dar comienzo a un diálogo sobre el acoso! A Spanish edition of an early classic by Dr. Seuss book—perfect for discussions about bullying! Featuring all-new color-enhanced illustrations, this story about a young peasant and his unjust treatment at the hands of King Derwin is one of Dr. Seuss's earliest and lesser known works. It's nevertheless totally Seussian and addresses subjects the good doctor was passionate about throughout his life: the abuse of power (as in Yertle the Turtle and Horton Hears a Who! ); rivalry (as in The Sneetches); and of course, zany good humor (as in The Cat in the Hat and the 43 other books he wrote and illustrated)! As timeless today as when it was first published in 1938, it's a perfect choice for Dr. Seuss fans and for sparking discussions about bullying!